The Sagely SMART Weekly Pill Organizer solves the challenges people have with traditional pill boxes. The clever design improves the experience of managing pills and vitamins to make it easier and more accurate. The flexible lids allow for easy pill retrieval. The vibrant lids are also color-coded indicating AM and PM. The 7 containers sit on a magnetic base to keep them all together. The ergonomic design is simple to use - even for people with manual dexterity issues. The lids are designed for the user to be able to count out their pills on top of the lids for accuracy before the pills are pushed through into the containers. Individual containers can be removed from the base for people on the go. 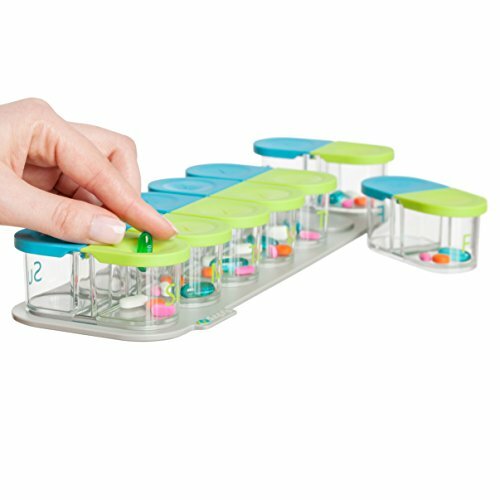 LARGE PILL ORGANIZER - 7 day pill box on a magnetized base that fits large pills like Fish Oil, Vitamin D, Calcium, and Multi-Vitamin supplements. Perfect for those who need an extra large pill organizer to fit all of their medications and vitamins. VERSATILE PILL ORGANIZER FOR 7 DAYS OR 14 DAYS - Use as a 7 day weekly pill box for AM/PM pills twice a day or use as a 14 day pill box if you only take your pills once a day. With our fun & easy to use Push-Through design, use your finger to push the pills from the lid into the container to improve loading accuracy. The flexible lids are easy to open and perfect for people with arthritis and other manual dexterity issues. BPA-FREE - Food-safe, high quality materials to protect your family's health. The clear pill containers make it easy to see what's inside. The pill case is sturdy, durable, and will last unlike cheaper pill boxes. PORTABLE CONTAINERS - Pop a couple of the detachable pill cases off of the base and take them with you for the day or a weekend vacation. The pillbox is ideal for shorter day or weekend travel. The lids will stay closed so your pills do not spill out in the bottom of your bag or purse. FREE APP - Free Sagely Pill Reminder App available for Apple and Android devices so you never forget to take a dose. Our medication reminder app works as your pill box alarm - simply enter your pills and the times you need to take them! If you have any questions about this product by Sagely, contact us by completing and submitting the form below. If you are looking for a specif part number, please include it with your message.